Morning After Leftover Lunch: This week my daughter is off of school so I thought I'd show you what we did with the leftovers from our pulled pork taco meal that I posted recently. Thanksgiving is this week so I thought this idea would be especially helpful. My family loves leftovers and turkey can be used for so many things. Turkey sandwiches are usually the go-to-meal the next day. But what about tacos? I used pulled pork here but turkey would work nicely too. What makes tacos great in your kid's lunchbox is it gets them involved in constructing their own lunch. This lunch construction idea can also be a way to get your children excited about eating healthy food. Give it a try, its crazy enough it just might work! 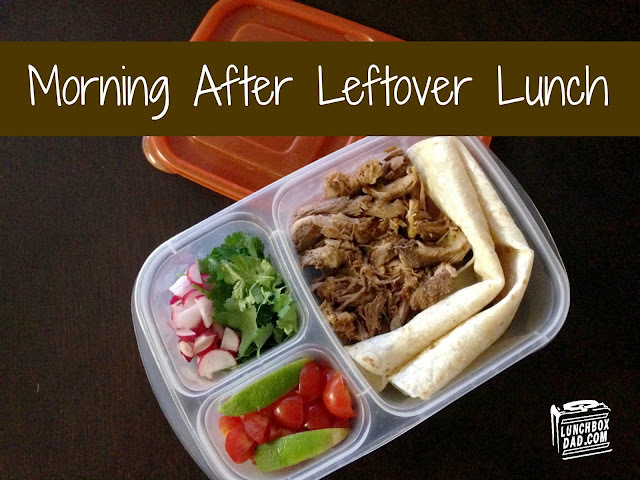 I made this in an Easy Lunch Box container which is not only great for packing lunches, we also use them regularly to store leftovers in the fridge as well! To see my recent recipe for these Pulled Pork Tacos click here!